See location of Michałków Airfield (EPOM) on Google Maps. Ostrów Wielkopolski, the nearest city is located as shown on this map. Poland is in the Schengen Area. Those of you coming from outside of the Schengen Area shall expect typical border formalities. Please take this into account while planning your journey. If you need a formal invitation for your team (eg. to obtain a visa), Organisers will provide you one when asked. 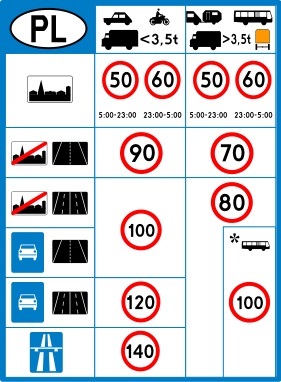 Road network in Poland offers full variety of road types and their quality. In general, we recommend using main roads and highways than taking shortcuts with local roads. Highways (motorways, "autostrada") are marked on blue background. Some of them are toll roads with toll booths. Other highways and express roads are paid with an electronic ViaToll system. This one does not apply for cars with maximum allowed total weight below 3,5t. However, if combined maximum allowed masses of your car plus trailer exceed 3,5t, you should install ViaToll box and pay for travel. Information about the system and map of roads covered by ViaToll may be found on their website. Unleaded fuel for car engines is available in 95 and 98 grades, usually marked as Pb95 and Pb98 in green colours. Sometimes they forget to put a line across the "Pb", but it is still unleaded. Diesel fuel is marked as "ON" on black. Those of you using Propane-Butane should look for LPG letters. Rest of you should avoid using "gas" word, as "gaz" is a polish word referring to LPG. Speed is controlled both by stationary Police cars and video radar booths. There are also a few unmarked police cars able to record speed and manoeuvres. Your headlights shall be turned on at any time on road, dedicated daytime lights may be used if your vehicle has any. You may find using the navigation road signs a bit tricky at the beginning. In general, pay more attention to the road number of your choice than the city name shown. We strongly recommend using a GPS navigation system, which will be especially useful during retrieves. Make sure your navigation database is updated, as there are many new roads of good quality which you do not want to miss using the old ones. If you're coming from southern directions, make sure to avoid city center of Wrocław using new A8 motorway bypass. This will save you about an hour of driving.